Stop in beautiful Key West for some sun and expansive ocean vistas before arriving in Cuba, where you can walk the bustling streets of Havana and sample local cuisine and dance the night away. The Empress of the Seas was first launched in 1990 and underwent a $50 million renovation in 2016. This Sovereign Class ship sails across the Caribbean and Cuba. It features three types of suites and five different staterooms to choose from and has room for 1,602 guests. Previously known as the Nordic Empress, the Empress of the Seas is a smaller ship, but still packed with amenities. Let Dunhill Travel Deals help you find the best price and deal on your sailing. We’ll search for great promotions and exclusive specials you won’t find anywhere else. Royal Suites offer more room and extra amenities for guests who want to travel in style. These 587 sq. ft. rooms feature double beds, private bathrooms with whirlpool tubs, and separate seating and living areas with refrigerator and wet bar. Size: 180 to 283 sq. ft. These suites offer private balconies, living space between 180 and 283 sq. ft., private bathrooms and also include two twin beds that convert to a queen. Size: 112 to 155 sq. ft.
All Junior Suites include a small sitting area and private balcony. They also offer two twin beds that convert to a queen and 112 to 155 sq. ft. of living space. Size: 111 to 206 sq. ft. Ocean View Staterooms also feature two twin beds that convert to a queen, a vanity area, and a private bathroom. Rooms range from 111 to 206 sq. ft., and select staterooms have two Pullman beds. Size: 109 to 131 sq. ft. This standard stateroom features 109 to 131 sq. ft. of living space. They include two twin beds that convert to a queen, a vanity area, and a private bathroom. Some staterooms have two Pullman beds instead. When you sail on the Empress of the Seas, you’ll be surprised by how many activities you can choose from. Unwind with a relaxing treatment at the full-service spa, take a dip in the pool or one of the Jacuzzis, try your luck in the world-class Casino Royale, or sit back and enjoy the Sequins and Feathers Broadway-style show. 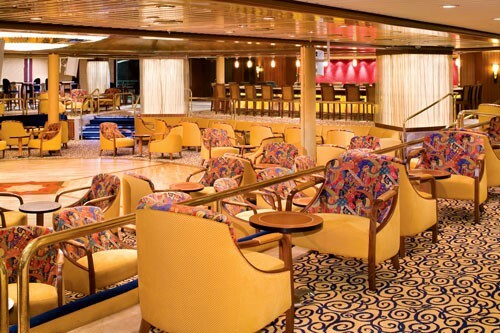 There are also 3 bars and lounges to visit with no cover fees, and, if you need to stay connected, use VOOM, the fastest Internet at Sea. Watch a movie at the the outdoor movie nights, get scuba certified, play a rousing game of ping pong, and learn to salsa at a Latin dance class. With many complimentary dining options along with specialty restaurants, you can have a sumptuous meal while you sail through the Caribbean. Boleros Lounge serves authentic Cuban cuisine. 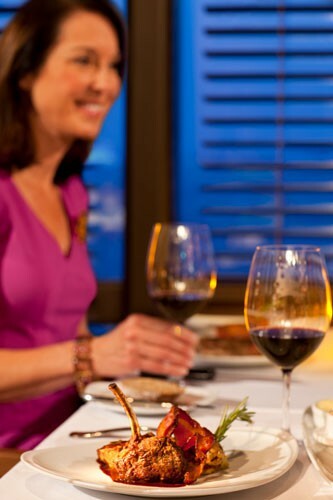 You can dine on a delicious meal, sip your favorite cocktail, and dance the night away. Call to book exclusive rates! Free specialty dinner for 2!